Each Insulated Packaging Kit will fit approximately 120 Hershey chocolate bars or 120 Belgian chocolate bars. We recommend including our Insulated Packaging Kits with chocolate orders shipped to warm weather locations (above 75°F / 24°C) or during the warm weather months of May, June, July, August, and September. 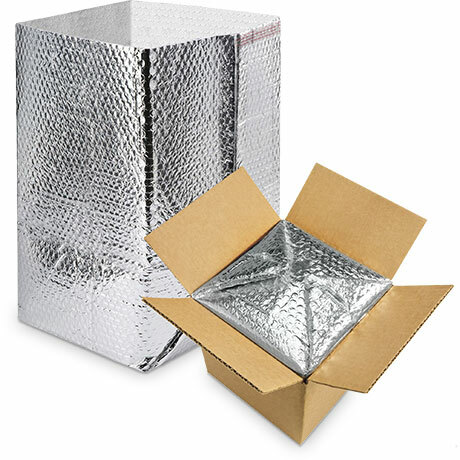 If you have any questions or are unsure if you should include insulated packaging with your order, please contact us and we can check the weather forecast for your region and at transit points in between. IMPORTANT: Our Insulated Packaging Kit provides protection for approximately 24 hours — select an overnight (UPS Express or UPS Express Saver) shipping service at checkout. Insulated Packaging should not be used with Canada Post shipping services! Please order a sufficient quantity of kits based on the total quantity of chocolate bars in your order.